Dave Robinson contracted energy renovations for 30 years and served the industry as president of the California Building Performance Association before starting GreenEarthEquities in 2008. He performs deep energy retrofits on foreclosed homes and and is building an Army of Energy-Wise Investors to do the same. As the principal of GreenEarthEquities, his column provides proven insights into the nuts and bolts of profitable energy-wise house flipping utilizing the latest green building tools and technology. After stints in the Navy and a fifth grade teacher, Dave spent 30 years as a building contractor with specialties in the Energy Trades, HVAC, Windows, & Insulation. Fascinated with the blower door since the early 90’s, and always wanting to “go for it,” he built a sales force to sell whole house home performance… and found many ways to not sell home performance. Now semi-retired, with the company under sound management, Dave has started his next dream career and another company, GreenEarthEquities, which buys foreclosed homes and installs complete energy retrofits along with some nice remodeling before selling them to delighted first time home buyers. The concept is a Win for all concerned, The homeowner with lower bills and more comfort, the neighborhood with improved values, the workforce with green jobs, and the planet with less carbon burned. When he realized how much fun he was having and what a great opportunity foreclosed houses represent, he decided he had to share what he had learned. Through blogging, and teaching on a weekly free conference call and classes onsite in projects in process, Dave is recruiting and training an Army of Energy-Wise House Flippers. Prepare to be surprised, encouraged, and recruited as an Energy-Wise House Flipper, as you peruse this blog or listen in to one of the classes. After 40 years living in Fresno, CA, in 2010 Dave followed “the Grand Babies” to Virginia where he and his wife, Luelle enjoy their three grandchilren living only two miles away. Luelle’s career as a travel agent causes Dave to investigate energy efficiency world wide as he goes along on those cruises, protecting Luelle from piracy on the high seas…..someone has to do it…. When not developing new EnergyWise Renovation Systems and protecting his wife from pirates, Dave enjoys staying in contact with friends from across the nations and riding his recumbent bike. Dave Robinson of GreenEarthEquities Receives BPI’s 2012 Tony Woods Award for Excellence in Advancing the Home Performance Industry. The award recognizes the individual who has most advanced the home performance industry over the past year. Baltimore, Maryland, March 29, 2012 -The Building Performance Institute, Inc. (BPI), the nation’s premier standards development and contractor credentialing organization for residential energy efficiency retrofit work, yesterday honored Dave Robinson of GreenEarthEquities by naming him the 2012 recipient of the Tony Woods Award for Excellence in Advancing the Home Performance Industry in the Opening Plenary ceremony of the ACI National Home Performance Conference in Baltimore, Maryland. Robinson was nominated by industry peers and selected by an independent panel of impartial judges for his passionate commitment to performing deep energy retrofits on foreclosed homes, and for training others to do the same. His innovative approach has brought much needed home performance services to an often neglected corner of the residential housing market. Robinson performed energy efficiency renovations for 30 years and served the industry as president of the California Building Performance Contractors Association (CBPCA) before founding GreenEarthEquitiesin 2008. Robinson’s business model has been so successful that the U.S. Department of Energy has awarded two contracts to GreenEarthEquities for the development of demonstration homes in California and Virginia, to measure specially designed HVAC and duct system configurations featuring Robinson’s energy efficient home performance improvements. 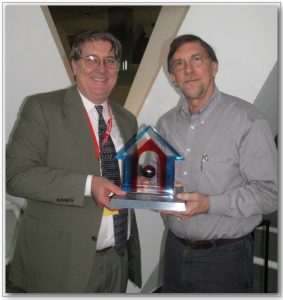 The Tony Woods Award for Excellence in Advancing the Home Performance Industry is an initiative from BPI in honor of Tony Woods, former president of Canam Building Envelope Specialists Inc. and ZERODRAFT®, and a pioneer of the home performance industry. During his career, he served tirelessly in the industry as a volunteer board member with BPI, Affordable Comfort Inc (ACI), as president of the Ontario Building Envelope Council and on more than ten standards committees dealing with air leakage control, air barriers, ventilation and more. He has presented on building envelope retrofit and home performance topics throughout North America and around the world. Woods passed away after a battle with leukemia on May 8, 2009, just over two weeks after the inaugural award in his name was presented by BPI.